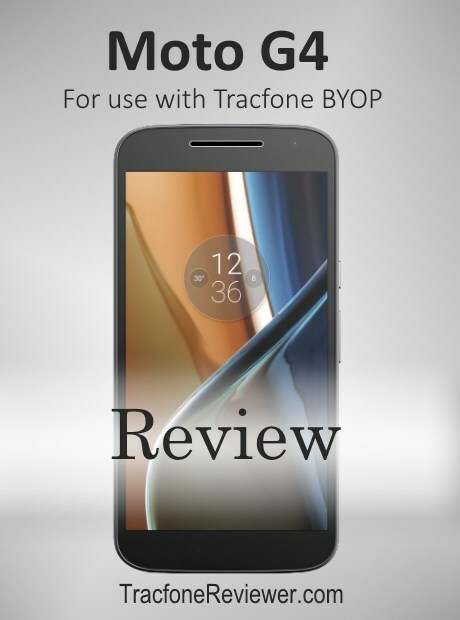 Below we share our review of the Unlocked Moto G4, and how you can use it with Tracfone BYOP. Here at TracfoneReviewer we share a variety of informational bout Tracfone Wireless. If you're new, be sure to take a loot at some of the other posts we have created. The Moto G4 is the 4th generation of a line of phones from Motorola that have been hugely successful for their combination of great features at a reasonable price. The 4th iteration of the Moto G is no exception and brings a lineup of solid performance, reliability and long battery life for a starting price of $200. 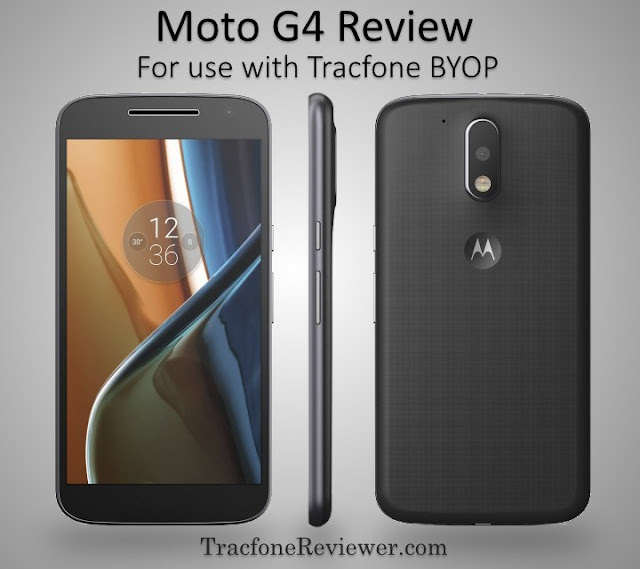 Below we will share our review of the Moto G4 (and G4 Plus/G4 Play), and how it works with Tracfone BYOP and a brief guide to activating it. There are several different versions of the Moto G4, each with a handful of differences, but mostly the same features. The three main versions are the Moto G4, Moto G4 Play, and Moto G4 Plus. 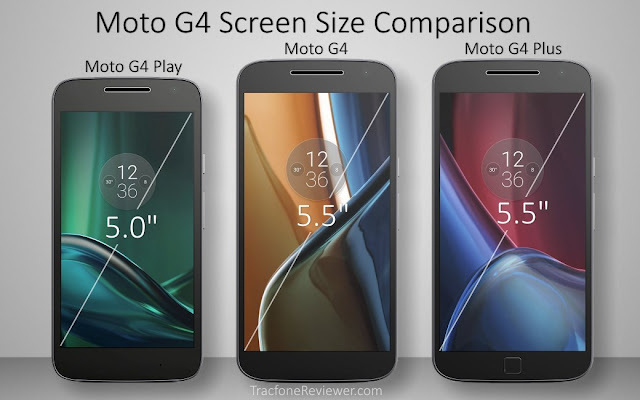 The G4 Play is cheaper than the regular G4, but has a smaller screen and certain other changes. Likewise the Moto G4 Plus has some improvements over the G4, at a higher cost. Let's take a look at the specs for each of these phones, starting with the mid-priced option, the Moto G4. These are the main features and specs. For a complete rundown, visit GSMArena. You also get all of the other typical features found on a smartphone like GPS, WiFI, FM Radio, MP3 Player, threaded SMS, email, and more. There are three big features that stand out on the Moto G4 compared to Tracfone smartphones in this price range. The G4 has an Octa-core processor for great multitasking capability, 2 GB RAM to complement that, and a 13 MP Camera with plenty of features. We recently reviewed the Samsung Galaxy Sky, which was released for closer to $120, but only has a quad-core processor, 1.5 GB RAM and 5 MP Camera. Let's take a look at another version of the Moto G4 that is cheaper, and also a little smaller. As you can see, the Moto G4 has a smaller, 5" touchscreen, just a quad-core processor and only 8 MP rear camera. However, it still comes with 2 GB RAM, 16 GB memory and Android 6.0.1 (with upgrade to 7.0 coming soon). The Moto G4 Play is built more for the everyday causal users, but still has decent specs to handle most games or apps. For the real powerhouse of the Moto G4 lineup, let's look at the G4 Plus. The Moto G4 Plus also has a fingerprint reader for unlocking the device. If you're going to spend the extra money on the G4 Plus, you might as well get the 64 GB version because it also comes with 4 GB RAM. This pairs very nicely with the octa-core processor for more demanding apps or games. More RAM allows the phone to have more going on at once, so it will be less likely to freeze or slow down. The fingerprint sensor is surprisingly useful and convenient for quickly and securely unlocking the device. It does have trouble recognizing a fingerprint if it is wet. We will go into a little more depth on some of the features for the G4 and discuss the pro's and con's of the Moto G4, G4 Play and G4 Plus. The internal memory and RAM on the Moto G4 is very acceptable in a budget smartphone and the Octa-core processor allows the phone to keep up with most apps and games. For low to moderate smartphone users, 2 GB RAM and 16 GB memory is plenty. However, for users who will be taking a lot of photos or video, or want to load a lot of apps on the phone, 32 GB or even 64 GB will be a better choice. The fact that the G4 Play also comes with 2 GB RAM and 16 GB memory is a great deal. It doesn't have the same processor however, running just a quad-core 1.5 Ghz processor. There is some occasional lag and stuttering on the G4 (all versions), which likely is not from a lack of processing power, but more likely due to firmware issues that need to be cleaned up. The phone may see some improvements when upgraded to Android 7.0, and let's hope that includes the stuttering issues. It isn't a very common issue, and only appears occasionally in certain applications or when switching between windows. The 5.5" screen on the G4 and G4 Plus is full HD 1080x1920 resolution and looks great with good brightness and contrast levels. It also has Gorilla Glass 3 protection. The G4 Play has the smaller 5" screen with HD 720x1280 resolution and also looks quite good. When it comes to the camera, the Moto G4 Plus has a 16 MP rear camera with a larger sensor compared to the G4 at 13 MP, and better low light shooting plus laser auto focus. It is a very nice improvement, and renders nice, clear photos in good lighting conditions. While it is also better at low light versus the G4, the G4 Plus still doesn't take great low light photos (but few smartphones do). The 8 MP camera on the G4 Play can take good photos in good lighting conditions, but don't expect much more out of it. All three phones have a variety of different features like panorama, HDR and flash. All three versions of the G4 are capable of recording full HD video at 30 fps. Video quality is good, and the phone does have optical image stabilization to help smooth out your shots. Videos shot at night do have noticeable noise. Battery life on the Moto G4 is excellent, with the G4 Play providing the best battery performance of the three (due to the smaller processor and screen). These phones truly have 'all day' battery life and on many occasions we've noticed nearly 50% charge remaining after a full day with moderate use. Charging speed is also impressive, with all three devices charging very quickly. Finally, what makes the Moto G4 such a great device to pair with Tracfone BYOP is that you can use it with either CDMA or GSM service. Just choose the correct SIM card, and follow the activation process (which we will provide more details on further along). Overall, our experience using the Moto G4 Plus with Tracfone BYOP has been nearly flawless. Data and picture messaging (MMS) have both worked without any issues. The phone itself is fast, powerful and has plenty of storage. The 5.5" screen is large, but easy to get used to and videos, games or photos look great on it. The single front speaker does a good job, and gets loud enough for most needs. The occasional stuttering is not very noticeable, but should be considered when purchasing this phone. Which Moto G4 Version is Right for You? Originally Motorola had three different 'budget' phones; the Moto E, Moto G and Moto X. They have now decided to just offer one phone, but with three variations. All three of the new variations on the Moto G are great value for the money, and they target different people who have different needs for a phone. The Moto G4 has great specs for the price, but may be limited on internal memory unless you choose the 32GB option. With the G4 Play you get a smaller and cheaper phone, but also sacrifice some performance and camera resolution. For the 64 GB Moto G4 Plus you get lots of memory and RAM, plus other great features, but the cost starts to get a little high for some, and there are a number of other good phones in this price range (each with certain pro's and con's). In the end, the right phone for you is one that you can afford, and will fit the demands you plan to put on the device. For many, the Moto G4 Play is more than adequate with nice snappy performance, and a convenient size. However, for just $50 more the regular G4 has a number of improvements that make it a good choice for moderate to heavy smartphone users. It has a better processor for running more apps, and an improved camera. We've seen all of the versions of the Moto G4 on sale for $20 or more below retail price, so it might be worthwhile to wait for a sale if you need to get the most bang for your buck. The Moto G4 can be activated as either a CDMA or GSM device. We've tested it on Tracfone's GSM network with complete success. We have also received reports of successful activation on the CDMA network, although some users have run into issues. 3. Choose whether you will activate with CDMA or GSM coverage, and use the matching Micro SIM card from the kit. 4. Insert the SIM card into the phone by removing the back cover, taking out the existing SIM tray, and replacing it with the Micro SIM card. 5. Visit the Tracfone website or call Tracfone to continue the activation process, which will include choosing if you want to activate a new phone number or transfer an existing number. 6. Once activation is complete, test the functionality. Sometimes turning the phone off(by holding down the power button for 3 seconds) and back on is required before the phone recognizes the SIM. For additional activation information, and advice on what to do if you run into problems, visit our Tracfone Smartphone Activation Guide. If you already have a device on Tracfone's BYOP program, and it uses the same SIM card, you can actually just take it out of one device and put it in the other. We tested this going from a 1st generation Moto G to the Moto G4 Plus and everything worked after restarting the phone, including MMS and Data. We don't necessarily recommend this route, but, as of yet, we've experienced no issues. There are plenty of cases on covers available from both Amazon and eBay. That concludes our review of the Moto G4. We hope this information is helpful for those considering this phone as an option to use with Tracfone BYOP. There are also many other great smartphones to use, and we've even created a list of the Top 6 Smartphones to use with Tracfone BYOP. Leave a comment below with any questions or thoughts you want to share. All comments are moderated for a short period of time before posting. Also get involved on our Facebook Page where we share the latest news and information with our active community of over 2300. For more information on the BYOP program, visit our Tracfone BYOP page. And you can also take a look at some of Tracfone's smartphone options on our Cell Phone Reviews page. Welcome to TracfoneReviewer, an independent website for news, reviews and other information about Tracfone. If you're new, be sure to take a look around at some of the other helpful information we have shared. The Samsung Galaxy Sky has a 5" touchscreen, quad-core processor with 1.5 GB RAM, and runs Android 6.0. It also has 16 GB internal memory, something very few smartphones from Tracfone have at this time. We recently reviewed the Samsung Galaxy Luna, which has a number of similarities to the Sky, although it differs in screen size and internal memory. We will look more closely at how these phones compare, and several others from Tracfone, further along in our review. 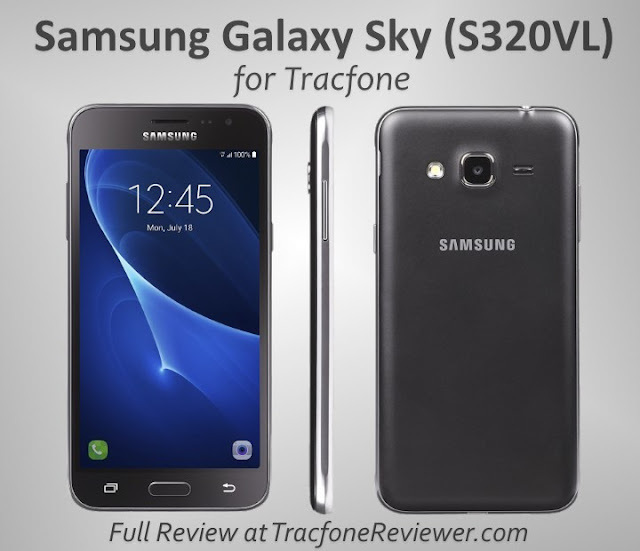 Tracfone has released a number of new smartphones in 2016, and the Galaxy Sky, which was released in November, might be one of the best budget friendly options yet. Lets look at the quick facts for the Galaxy Sky to get an idea of what it offers. A major complaint that consumers have had with Tracfone is their lack of smartphones with 16 GB internal memory or more. The majority of Tracfone smartphones only have 8 GB memory, which fills up fast even if you only load a handful of apps. The Galaxy Sky comes with 16 GB which can hold a lot more apps, photos and more. The ZTE ZMAX 2 is another option that also has 16 GB internal memory. Of course, there are plenty of unlocked smartphones that have 16 GB internal memory or more. Take a look at our list of the Best Unlocked Smartphones to use with Tracfone BYOP for some ideas or go straight to our BYOP page. But there are some more great features on the Sky, so let's take a look at the full list of features and specs. Size: 5.60" x 2.79" x 0.31"
The Galaxy Sky is a little larger than many of the older smartphones from Tracfone such as the LG Ultimate 2 or Samsung Galaxy Stardust, but at 5", it is still a convenient size that will fit in most pockets or purses. Notice that the screen is Super AMOLED, which means deeper blacks, and in some cases, better battery life. Let's take a closer look at some of the key features on the Galaxy Sky with our full review. Below we share what we like about the Sky, and what we don't like. There's a lot to like about this phone, but some of the key features that make it popular are the battery life, internal memory and Android OS. Samsung Galaxy Sky front, side and back. Notice the rounded edges and slim design. The battery life on the Samsung Galaxy Sky is very good compared to most other smartphones. The Sky doesn't have a large battery, but a combination of the screen, processor and operation system help conserve power to make it last all day with normal use, or nearly two weeks on standby. A longer battery life is something everyone can enjoy, whether you use your phone often or not. Android 6.0 comes with a number of improvements, fixes, and upgrades (including better battery performance). One of the improvement is better integration of external Micro SD cards, however, it doesn't appear that the Sky is able to fully integrate external storage as if it were internal storage. . Speaking of storage, the Galaxy Sky has 16 GB, with about 11 GB usable space. This is a great improvement over many of Tracfone's other smartphones. Additionally, the combination of 1.5 GB RAM with the quad-core processor is more than adequate for the phone to handle most activities and apps. We also want to mention the touchscreen, which has HD resolution and good colors. As we mentioned above, the 5" screen is a comfortable size for many and looks great, qith good colors and sharpness. The Samsung Galaxy Sky packs nearly everything we would want in a budget smartphone from Tracfone. But there are some negatives we want to mention. The main drawback with the Galaxy Sky is the front and rear camera. The rear camera is only 5 MP, while the front is 2 MP. The quality is reasonably good, but at such a low resolution, you will probably want something better to capture any important memories. It also appears that external Micro SD cards may not be integrated as internal memory the same way many other Android 6.0 devices are able to do. We're not sure why there is a difference with the Galaxy Sky, but will add additional information as it becomes known. Finally, the Samsung Galaxy Sky does come with a handful of apps most users won't want, but it is possible to remove some of them, or at least disable them. Most phones come with a variety of pre-installed apps, so this is not something specific to the Sky. That concludes the issues we've found with the Sky. It is a well rounded phone in most ways and ideal for moderate smartphone users upgrading from an older Tracfone smartphone. The Galaxy Sky brings some very popular features at a reasonable price to Tracfone users who have been waiting a long time. While the camera is not a strong point, the phone does excel in many other ways, especially battery life, screen quality, and overall performance. Compared to the Samsung Galaxy Luna, the Sky is a little more expensive, but also has twice the internal memory, and a larger screen. They both have the same processor, RAM and cameras. The Samsung Galaxy Sky is a significant improvement over many older Tracfone smartphones like the LG Ultimate 2, Moto E and Samsung Galaxy Stardust for many reasons, but especially the 16 GB memory and Android 6.0 OS. They phone will be smoother and faster than older devices, as is to be expected. While we do expect Tracfone to continue to release smartphones with similar or improved features in 2017, the Samsung Galaxy Sky is a great phone, and, with some of the airtime bundles below, a great deal. For additional information on how to use the Galaxy Sky, take a look at the interactive tutorial. Prices may change, and HSN will probably sell out sometime in the near future. 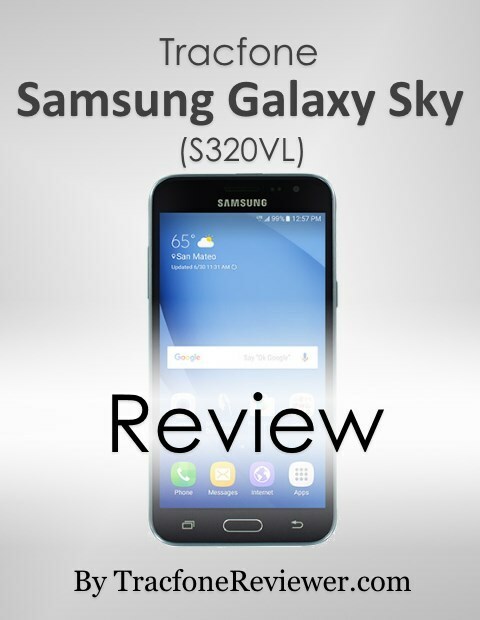 That concludes our review of the Samsung Galaxy Sky. We are excited about the improvements this phone has over older smartphones. Let us know your thoughts or questions in the comments below. Get the latest news, updates and information by following us on Facebook. 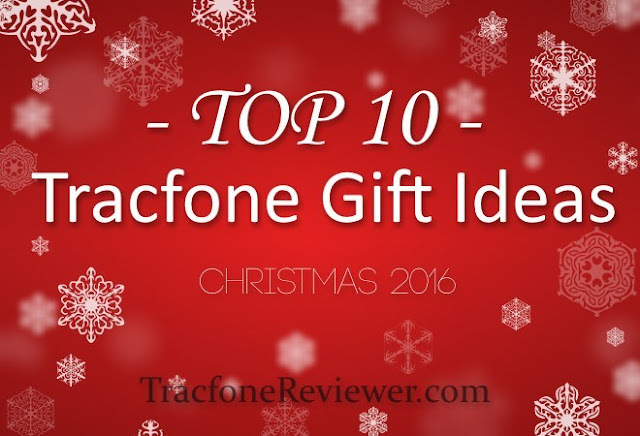 We've created the TOP 10 Tracfone Gift Ideas so take a look if you're looking for gifts for someone (or even yourself). Tracfone Airtime Comparison - Which Card is the Best Deal? Welcome to TracfoneReviewer, below is our annual list of gift ideas. If you're new here, be sure to take a look at some of our other Tracfone related information! We're here to help! With the latest phone and accessory gift ideas for Tracfone users. This list includes Tracfone smartphones, unlocked devices to bring to Tracfone, great accessories for smartphones, and a few extra ideas. 10. Personalized Coupon for a Phone, Accessory, Game etc. While this list is geared towards those who use Tracfone, many of the ideas here (especially the accessories) are great for anyone who uses a smartphone. Tracfone Wireless offers flexible prepaid service that can be a great way have a cell phone at a reasonable price. If you're not familiar with how Tracfone works, visit our Beginners Guide to Tracfone for some helpful information. Now, let's get straight to our list of 10 Christmas gift ideas! A new phone brings new features, and new possibilities. From improved performance, to better cameras, everyone enjoys an upgrade. Here are some of the latest smartphones from Tracfone. These make great gifts for almost anyone, from kids to adults, and are usually fast and easy to set up. Most Tracfone cell phones are relatively inexpensive - between $50-150, which is great, but they don't always have the best cameras or a lot of memory. They generally make great phones for those who are low to moderate phone users, and stick with a handful of the basic apps. It is important to know whether you need a GSM or CDMA compatible device. Tracfone uses several other major cell phone service providers, including AT&T for GSM service, and Verizon for CDMA. So check which service is best for your area. Some locations have service from both. Samsung Galaxy Luna - 4.5" Touchscreen, Android 6.0 and quad core processor. But the Luna only has 8 GB internal memory, and 5 MP rear camera. View our full review of the Luna or view the Luna on HSN or from eBay. ZTE Max Duo - The largest screen on any Tracfone at 6", the Duo also has 16 GB internal memory and a 13MP rear camera. It is a little more expensive at around $200, but comes with an airtime bundle from HSN. iPhone 5S - Tracfone now offers the iPhone 5S (and iPhone 6) for use on their prepaid network. While the 5S is a few years old now, it still has a great camera, and runs on iOS. Plus it is reasonably priced at $199. The iPhone 5S has been available from Target. Learn more about the iPhone 6 and 6 Plus also available from Tracfone by following the link. Samsung Galaxy Sky - Released at the end of November, the Samsung Galaxy Sky is a great value with a 5" super AMOLED screen, 16 GB internal memory, Android 6.0 and quad core processor. The only drawback might be the 5 MP rear camera. Retailing for a round $150, you can find the Sky bundled with minutes from eBay and HSN. ZTE Citrine - A very budget friendly option, the CItrine has a 4" touchscreen, 8 GB memory, 5 MP camera and runs on Android 5.1. It isn't a very powerful device, but at $30 from many retailers, it could make a great option for kids, or as a backup. Visit our ZTE Citrine Review for more details and where to buy. We've also found it for $30 on eBay. For more phone options and ideas, visit our Cell Phone Reviews page where lists all our recent reviews of Tracfone devices. Next are some unlocked phones that can be brought to Tracfone. Almost any unlocked smartphone can be used with Tracfone. As with Tracfone smartphones, it is important to know whether you need a GSM or CDMA compatible device (although the first phone on our list is compatible with both). Many unlocked smartphones, including the ones we've listed here, have more features and performance compared to most Tracfone smartphones. They generally have more memory and better cameras, which is important to some users (particularly teenagers). Buying an unlocked smartphone for a friend or family member is best if they tend to use their phone often, and enjoy using a wide variety of apps like Facebook, Instagram and Google Maps (or games!). The newer the phone, and the better the specs, the faster it will run and the more apps it can handle. Moto G4 (and Moto G4 Play) - The G4 has a large, 5.5" touchscreen, 16 GB memory, 2 GB RAM, Android 6.0 and 13 MP camera. It is one of the best all-round phones available for the price at this time. There are a number of other great phones in this price range, but the Moto G4 is convenient because it is compatible with both GSM and CDMA networks. There is also a cheaper version, called the Moto G4 Play, which has a 5" screen, 8 MP camera but many of the other same features, for $50 less. You can find the Moto G4 on Amazon for $199 and the G4 Play on Amazon for $149. They are also available from other retailers like BestBuy, Target and Walmart. Visit our list of the Best Unlocked Smartphones to use with Tracfone BYOP for more great ideas and also take a look at our Tracfone BYOP page which has details on requirements, how it all works and more. Most people use a case or cover for their smartphone to keep it safe and protected. Some cases are very simply, and offer a small amount of additional protection from drops. Other cases are fully waterproof, making the phone nearly indestructible. For popular phones like iPhones, there are many different cases available, and you might even be able to find one that matches the personality of the person you're giving it to. There are a lot of phone cases and covers on both Amazon and eBay. It can be hard to find the right case sometimes, but try searching using the name of the phone, plus case, or cover etc.. For example, if you're looking for a Moto G4 case, simply search on Amazon 'Moto G4 case' or 'Moto G4 waterproof case' and browse the results. For some additional information on cases, including a short explanation of different types, visit our Tracfone Covers and Cases post. Remember the time when you could charge your flip phone once every two weeks? Well smartphones use a lot more power, and run out much faster, so why not gift an external battery pack/charger? The battery pack stores power for when your phone starts to run low, and then you simply connect them, and your phone gets recharged. No need for a wall socket, now you can recharge your phone from anywhere. There are many external battery packs available, and they range in the amount of power they can hold, and other features. The Anker Astro (5200mAh) charger is a popular choice on Amazon and is also extremely small and compact. Last check it was just $16. There are also solar powered chargers available that boast features like being waterproof, shockproof and more. Might be a fun gift for the adventurous. Every Tracfone user can enjoy the practicality of extra Tracfone airtime. You can purchase a range of cards at different prices, from the 60 Minute card for $20, to the 1 Year/400 Minute card for $99. Plus, there are several Smartphone-only airtime cards that also offer great value. Data only refill cards and Text only cards are both reasonably priced at $10 for 1 GB data and $5 for 1000 texts. These might be ideal for teenagers. Prepaid airtime cards can be a great way to say, 'I want to hear from you more!' and you can find them in almost any retail store, and also from eBay, Amazon and other retailers. Check out our Tracfone Airtime Comparison for details on which airtime cards are the best deal. Some apps and games on the Apple and Google app stores cost a few dollars, and giving a gift card to cover these purchases is a convenient and safe way to allow kids (or adults) to have some fun. Google Play Gift Card - Like the iTunes Gift Card, but for Android devices. The Google Play gift card works in the Google Play Store, and you can redeem for a wide variety of music, apps, games and more. Widely available in stores, online retailers like Amazon, and from Google. Amazon Gift Card - Can be used to purchase almost anything from Amazon, which includes many options such as music, videos, apps, games, and more. Gift cards come in almost any amount. eGift cards are also available, which you can send via email or text. View amazon gift card options. Streaming music from a smartphone is a popular feature and whether you use Pandora, Spotify or something else, and headphones or a Bluetooth speaker are great for covering any music needs. A Bluetooth speaker can wirelessly connect to a smartphone, and play music like you would from a CD player. It is great for get-togethers, parties, or even outdoor activities. There are many options available, including this portable waterproof speaker and poplar water-resistant Bluetooth speaker. For headphones, there are several different styles, including over-ear noise canceling, or in-ear headphones. Many of Tracfone's smartphones only have 8 GB internal memory, which can be used up pretty quickly. Adding external memory with a Micro SD card is a nice way to expand the memory on the phone, and add additional music, photos or other content. Make sure to check first that the phone has a Micro SD card slot, which most Tracfone smartphones do have, but not all. There are a lot of options for Micro SD cards, but the Samsung 32GB Micro SD card is a great value at just $10. You can also get 64GB, 128GB and 256GB, but make sure the phone can accept larger size cards before you buy. 10. Personalized Coupon for a Phone, Accessory, Game or anything else. If you're having trouble narrowing down the gift ideas, you could always create a personalized coupon that is good for one Phone, Accessory and anything else. Try to make the coupon specific, and personalized. This can be a fun and easy way to make sure a picky recipient ends up with what they want. If you have a friend or family member who isn't very familiar with how to use a smartphone, consider this How-to book on using Android smartphones. Additionally, if you already have some know-how, you could offer some lessons on the basics of using a smartphone, like turning it on and off, texting, and using basic apps. There are also some great online tutorials that are completely free. That concludes our Christmas gift ideas for 2016! We hope these ideas will help you find the perfect gift for everyone on your list. Let us know in the comments if you have any thoughts or questions, or even additional Christmas gift ideas! Join or Facebook page where we share the latest news, posts, deals and more. 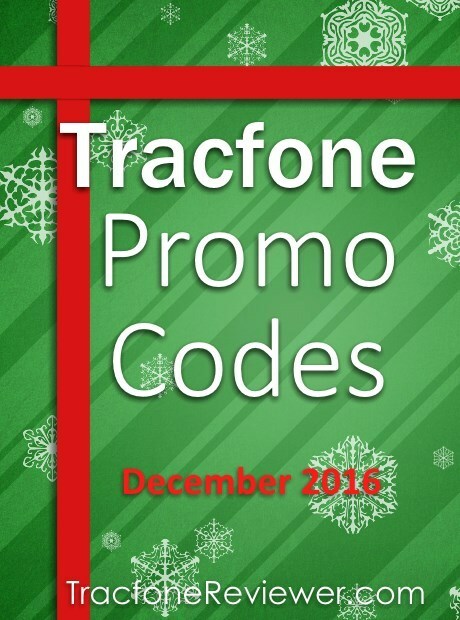 We've updated our Tracfone Promo Codes for December, so take a visit before you add an airtime card. Promo Codes might also work on smartphones, so worth trying. Also visit our Guide to Activating or Transferring a Tracfone Smartphone for tips and advice on that process, or read up on 4 Ways to Check our Airtime Balance on Tracfone Smartphones. 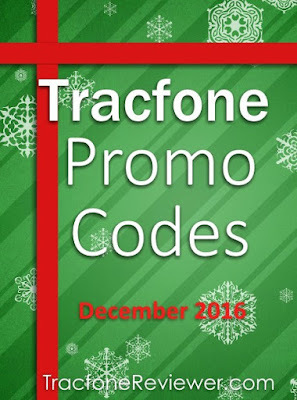 Welcome to TracfoneReviewer, a blog with the latest Tracfone Promo Codes plus much more about Tracfone prepaid cell phones. If you're new, be sure to take a moment a see what else we have to offer including cell phone reviews and lots of other information. December is usually time of celebrating holidays with families and friends, and getting reconnected. So what could be better then some free Tracfone minutes to go with it! Each month we gather and share the latest promo codes to use with Tracfone prepaid devices to get additional minutes for free. You can get form 20 to 250 free minutes, depending on which promo code you use. Promo codes are used when adding a Tracfone airtime card, and each promo code is for a specific airtime card (and can also be used with cards of greater value). For example, a promo code for a 60 minute card, will also work on the 120, 200, and 450 minute airtime cards. Promo codes are not supposed to work on Tracfone Android smartphones, or unlocked devices on the BYOP program, however, sometimes they do, so it may be worth trying. It appears that smartphone users are getting bonus talk minutes, but no additional text or data airtime. Tracfone offers a wide variety of phones to use with their prepaid service, and we've created reviews for many of them on our Cell Phone Reviews page, so take a look if you're looking for a new phone (or just want to see what's new). We just finished our review of the Samsung Galaxy Luna. We also just created a guide to the Best Unlocked Smartphones to use with Tracfone BYOP. If you want some ideas on which phones you can bring to Tracfone (that won't break the bank either) check out that post. Now, let's get tot he promo codes for December. We also have more codes on our main Tracfone Promo Code page. Below are the latest codes tested for December. That concludes our promo codes for December. We hope these codes work for you, and please leave a comment with which code you tried or any other questions you might have. We also have a great community on Facebook where our readers can ask, and answer questions as well as get the latest news and updates. Check out our new Top 10 Christmas Gift Ideas for Tracfone users for some help in gift-giving this holiday season. if you're curious about which airtime card is the best deal, we did a full breakdown on Tracfone Airtime Cards including the newer smartphone only cards. For those who might be new to Tracfone, visit our Beginners Guide to Tracfone and also our Guide to Activating or Transferring to a Tracfone Smartphone. Welcome to TracfoneReviewer, a website with news, reviews and lots of other information. If you're new, take a moment to check out some of the other Tracfone related content we share! 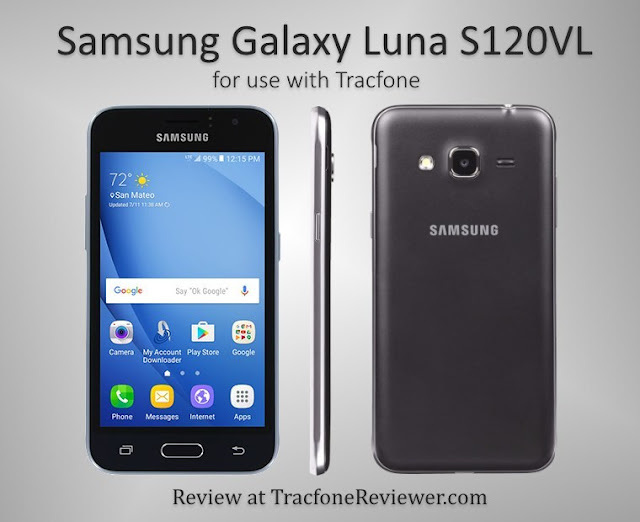 The Samsung Galaxy Luna is a budget friendly smartphone released by Tracfone in late 2016 to use with their prepaid cell phone network. The Luna features a 4.5" touchscreen, 8 GB internal memory, 1.5 GB RAM, 5 MP rear camera and runs on Android 6.0.1. It has 4G LTE capability and uses Verizon's CDMA network. In general, it has pretty standard features and specs for a Tracfone smartphone device, with a few improvements. Tracfone continues to release a variety of smartphones, including the iPhone 6 and 6 Plus (as well as the iPhone 5S). The Samsung Galaxy S5, S6 and S7 have also been available through Tracfone for several months now and offer high-end performance at prices of over $500. But they are still heavily focused on budget devices listed between $50-$200 because that is where the largest demand among Tracfone users exists. Don't forget that you can also buy an unlocked smartphone, and bring it to Tracfone. We just created a list of the Best Unlocked Phones to use with Tracfone BYOP so take a look if you want some ideas. You can also visit our BYOP page for more information on how it works. One of the key features on the Luna, and the reason it may be a good phone to upgrade to for some Tracfone users, is that it comes with Android 6.0.1 Marshmallow. This is a very recent version of the Android operating system, and has some nice improvements over past versions which we will explain more about later. The majority of Tracfone's low cost smartphone devices have only 8 GB internal memory and 1 GB RAM. This includes many of the recent phones we've reviewed like the ZTE Citrine, LG Rebel and LG Treasure. If you have used smartphones with limited memory and run into the problem of filling up your storage, you may want to consider a phone with more internal memory, such as the ZTE ZMAX 2 or unlocked phone options. We've just added the Luna to our List of 10 Tracfone Gift Ideas, follow the link to see the other Christmas gift ideas! Lets take a look at the full list of features and specs for the Samsung Galaxy Luna, followed by our review. Size: 5.22" x 2.73" x 0.35"
There are a couple of interesting features to notice about this phone. First of all, it appears to have 1.5 GB RAM with a 1.2 Ghz quad core processor which is a step up from many other low cost Tracfone smartphones and will allow it to multitask much better. The Luna also has a long standby time, which is due, in part, to the newer operating system. The Samsung Galaxy Luna is one of several great Black Friday/Cyber Monday Deals we've shared, so take a look so see where you can buy it at a discount, and some of the other phones available for super low prices. 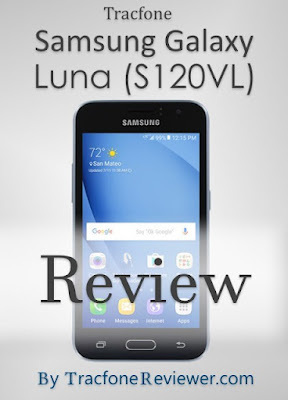 Let's dive into our full review of the Samsung Galaxy Luna where we will share the key features on this phone that make it good, and any drawbacks that might exist. This is a phone that comes with a few small improvements over other recent smartphones released by Tracfone that actually might make a big deal for some users. We like that the Luna comes with 1.5 GB RAM, Android 6.0 and a reasonable price. We would like to see more phones from Tracfone with 2 GB RAM, which allows the phone to run more applications at once, and generally means better performance. But this is a lot to ask for in a budget smartphone, and 1.5 GB is an improvement over 1 GB which is what almost every other recent smartphone from Tracfone offers. The most notable feature on the Luna in our opinion is that it comes with Android 6.0.1. This version of Android was released in 2015, but only newer phones are using it. Most of Tracfone's other smartphones use Android 5.1 or older. Android 6.0 brings several improvements, including a 'doze' feature which does a number of things to improve battery life (and leads to a much longer standby time compared to most other smartphones). Android 6.0 also allows greater external memory support, which were lacking in several of the previous Android versions. What this means is that the 8 GB of internal memory may not be so limiting, and users should be able to load apps, music, photos and other content onto the external MicroSD card (once the card has been set as 'internal memory'). The Samsung Galaxy Luna is a smaller phone, but packs some good performance and features for the price, and we would see this phone outperforming many older Tracfone smartphones. What is key to remember about the Luna is that it is a budget smartphone, which means that certain corners are cut to keep the cost low. In the case of the Luna, it comes with a somewhat small screen, low resolution camera, and low internal storage. Screen size on a smartphone is a matter of personal preference. Many smartphones now come with a screen size of 5.5 inches or more, which is great for viewing photos or videos, but may be bulky when trying to fit into a pocket or purse. The Luna has a 4.5" touchscreen which is a little smaller, but may be more convenient for some users. The screen appearance and resolution is good, but nothing fancy. Samsung Galaxy Luna only comes with 8 GB memory, which for many, isn't enough if you plan to run a variety of apps, store music and photos, or keep other content. However, the Luna does support up to 128 GB external MicroSD card, which should allow users not to expand the internal memory, although we haven't fully tested this yet. Finally, the front and rear cameras on the Luna are more of an afterthought. And while they do a reasonable job, they can't compete with most modern smartphones camera capabilities. If you only plan to use the camera for occasional photos in good lighting, then it should be fine. Otherwise, consider a phone with an improved camera. That concludes the main drawbacks we noticed on the Samsung Galaxy Luna. It performs very well compared to many of Tracfone's other smartphones, but isn't going to keep up with smartphones like the Moto G4 or iPhone 5S (but they are twice the price). The Luna is a small, but capable smartphone that is ideal for low to moderate smartphone users. But it has potential, with the ability to integrate the external storage, it could end up with the ability to store quite a lot via a MicroSD Card. Compared to the LG Rebel, which also has a 4.5" touchscreen and retails for a similar price, we would choose the Samsung Galaxy Luna for the newer Android OS, more RAM and overall better value. Compared to older smartphones like the LG Ultimate 2, LG Sunset, and Samsung Galaxy Stardust, we would also recce mend the Galaxy Luna simply because of the newer Operating System which has a number of performance and security updates. The Samsung Galaxy Luna is available from several online retailers, and from retail stores like Target and WalMart. There are also several Cases on Amazon available for the Luna. View the Samsung Galalxy Luna Interactive Tutorial. That concludes our review of the Samsung Galaxy Luna, we hope you have found it useful and let us know if we've missed anything, or if you have any questions. If you're new to Tracfone, check out our Beginners Guide to Tracfone which provides details on how Tracfone prepaid service works, and some other helpful tips. We've also created a Guide to Activating or Transferring service to a Tracfone Smartphone or BYOP device. We will also be sharing details soon on the Samsung Galaxy Sky, a very similar phone with a 5" touchscreen also available through Tracfone. Full list of Black Friday and Cyber Monday deals for 2016 on both Tracfone and unlocked smartphones you can bring to Tracfone. TracfoneReviewer will continue to update and add to this list as more deals become available! Black Friday is the largest day for deals and discounts, and we are here to share all the best cell phone deals for Tracfone, as well as unlocked devices you can bring to Tracfone's BYOP program. While not many of us like the crowds on Black Friday, we all do like getting a good deal, and for most of these deals, you can get them online so there is no need to get stuck in a crowd! This Black Friday deals list includes both Tracfone cell phones that are on sale, and also phones that are unlocked, and can be used with Tracfone through their BYOP program. Tracfone allows consumers to bring their own phone, and more and more people are doing just that. Visit our Tracfone BYOP page to learn more about how this weeks, and what the requirements are for your phone. We will be posting and updating the latest Black Friday ads and deals below throughout the month of November, and will also share Cyber Monday deals as we get closer to the end of the month. If you're new to Tracfone, or a little confused about how it all works, our Beginners Guide to Tracfone is a great place to start and learn some of the basics. We have also created a Guide to Activating Smartphones with Tracfone if you're switching or activating a new phone. We also just created a List of the Best Unlocked Smartphones to use with Tracfone BYOP so take a look if you're interested! We can also use your help! Leave a comment with any deals you find that we missed and we will add it to the list, and be forever grateful! Now let's take a look at these deals. 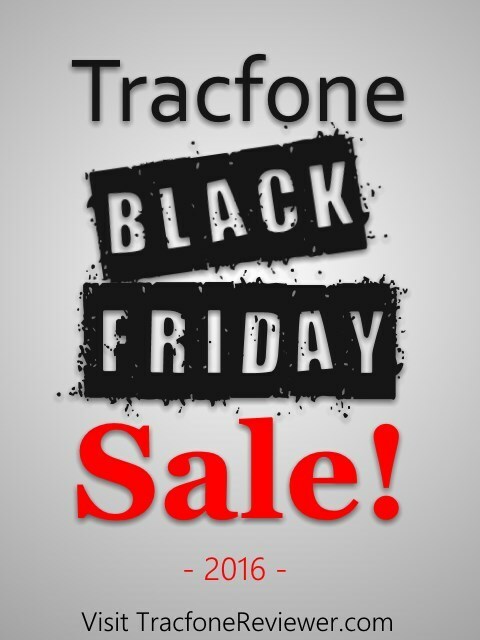 Below are all of the Black Friday deals for Tracfone. We will continue to add to this list and update it. Tracfone usually offers several phones at a discounted price for Black Friday and Cyber Monday. Offering several Straight Talk phones, but nothing for Tracfone at this time. That's our list of Black Friday and Cyber Monday deals for Tracfone. At this time, it doesn't have a whole lot of deals, but as we get closer to Black Friday we will add all the details. We hope these help you find the best deal on a new phone. If we've missed any deals, let us know in the comments. We share a variety of information about Tracfone here on this blog, including Cell Phone Reviews, Tracfone Promo Codes and much more. Take a look around if you're new and see what else we have. Join over 2000 others who Follow us on Facebook where we share the latest news, and are available to answer questions. Below are the latest promo codes for November 2016. TracfoneReviewer strives to provide the most accurate codes, and be sure to check out some of the other valuable reviews and news we provide about Tracfone. 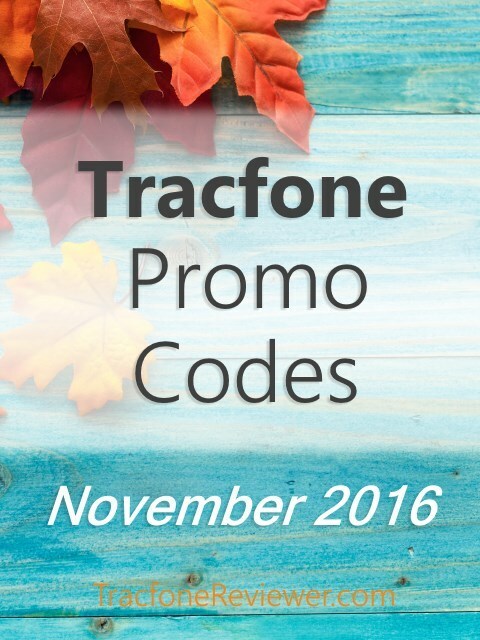 Tracfone Promo Codes for November! Tracfone uses promotional codes as an incentive for their customers. To get the free minutes, simply use a promo code when purchasing or adding an airtime card to your phone. In most cases, the bonus time is also automatically added. Some codes may only be used once, or are not available in every geographical location. Promo codes are not supposed to work on Android smartphones, but we've been getting reports that they may in fact work in some cases. Tracfone has continued to release more and more smartphones to use with their prepaid network. 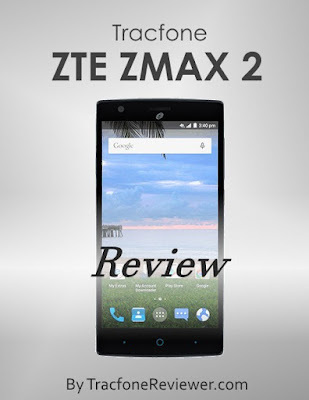 We recently reviewed the ZTE Citrine and ZTE ZMAX 2. You can also visit our BYOP page for details on bringing an unlocked phone to Tracfone, or our Cell Phone Reviews page for all our reviews. Remember, each promo code is for a certain airtime card, but can also be used on cards of greater value. So if you have a 200 minute card, the code for a 60 minute card will also work. Now, let's get to these coupon codes! Below are the latest codes that are valid and working for November 2016. These are the promo codes for November. We hope you enjoy the free minutes! Remember, we also have many more code options on our main Tracfone Promo Code page. Don't miss out on the latest list of Deals, Discounts and Sales including great BYOP phones. We also included details on some new phones Tracfone released. To stay up to date, follow us on Facebook where we share each new post, as well as other tips, news and deals. Finally, see our comparison of Regular airtime cards to the New Smartphone only codes - Which one is a good deal? Thanks for visiting, and leave a comment with which code you tried and how it worked! Welcome to TracfoneReviewer, a blog with helpful information about Tracfone cell phones. If you're new, be sure to take a look at some of the other articles we have created. 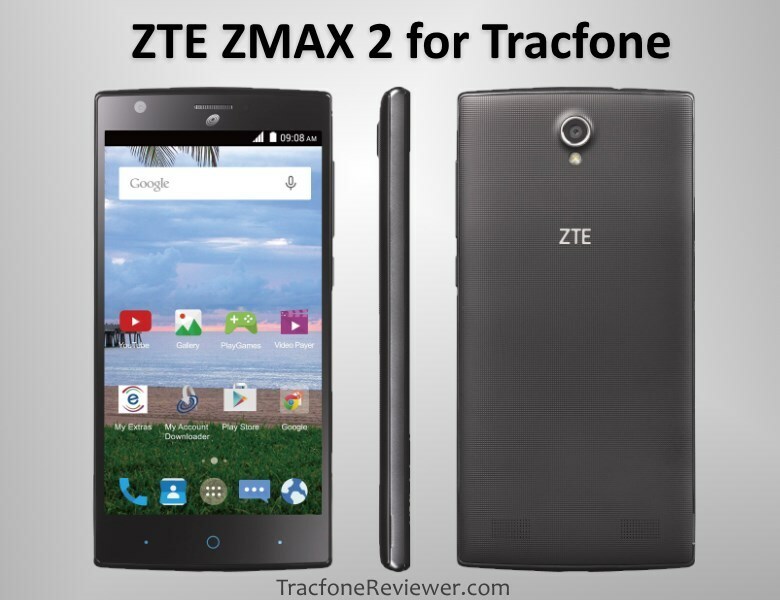 The ZTE ZMAX 2 was released in late 2015, and came to Tracfone in mid 2016, but it is a phone that has some features many Tracfone users desire, and at a price that is nearly unbeatable. Tracfone continues to release many new smartphones, and the ZMAX 2 was released several months back, but we are just now getting around to reviewing it. This is partially due to the great value for the price it offers, and also because Tracfone has released the 'big brother' to the ZMAX 2 in the form of the ZTE Max Duo. In this review we will share the features and specs for the ZMAX 2, followed by the pro's and con's and finally where you can buy and how it compares to some other Tracfone devices. Catch up on some of the other new phones Tracfone has been releasing by visiting our New LG/Samsung post, New ZTE/Alcatel phones, and New Apple iPhones available from Tracfone. We don't really have too much that is bad to say about this phone, but we will dive into some details further on. The key specs to take note of is the 16 GB internal memory and 2 GB RAM. These are features very few other Tracfone smartphones have, and allow the phone to be much more useful. We recently reviewed the LG Premier and LG Stylo 2, which have screens of 5.3" and 5.7". But the LG phones only have half the internal memory or RAM, which limits their ability to multitask, or store very many apps and other data. LG does have a reputation for quality and good performance in their phones while ZTE is less well known. ZTE is a Chinese manufacturing company and is one of the top mobile phone makers in China, and in the top 10 worldwide. They have increasingly been creating budget friendly phones that have good performance and features for distribution in the US and rest of the world. The ZTE ZMAX 2 is a phone that hits some high marks with the features it offers for the price, and may prove to be a good option for many Tracfone users. Let's get into the full list features and specs for the ZMAX 2 and see exactly what it offers. Size: 6.06" x 2.99" x 0.37"
There are some key features on the ZMAX 2 that make it stand out from most other budget phones from Tracfone (which we will go over a little further on). But what is really impressive is that the ZMAX 2 is about the same price, or even a little cheaper. The Tracfone version of the ZTE ZMAX 2 is only available from HSN.com at this time, but you can also purchase unlocked versions of the phone(on amazon) and activate it with the BYOP program. Unlocked versions cost a little less, but don't come with the airtime bundle which is a $100 value. Let's get into our full review of the ZTE ZMAX 2. We will share our key likes and dislikes about this phone below. Many of the features and specs on the ZTE ZMAX 2 are as good or better than many of the other Tracfone smartphones in this price range. The two most important features are the memory and RAM that come with this phone. Also impressive is the screen, camera and price. Many Tracfone smartphone users have found it annoying that Tracfone keeps releasing new phones with only 8 GB internal memory, and just 1 GB RAM. The ZMAX 2 doubles that, with 16 GB internal memory and 2 GB RAM. You end up with about 10 GB available space to store apps, photos, videos, music and anything else. This will likely be enough for most users unless you download lots of videos or music. 2 GB RAM makes this phone better at multitasking - it can run more apps at once before it starts to lag. We are surprised that the ZMAX is one of very few options from Tracfone at this time with 16 GB memory. We think Tracfone will add more budget phones with 16 GB memory, but at this point the ZMAX 2 is one of the cheapest phones with this feature. The RAM and memory the ZMAX 2 has is about the minimum a moderate smartphone user would want in order to load the apps, music and pictures on their phone, and not have it slow down. Beyond the internal memory, the ZMAX 2 also has a large 5.5" touchscreen with a resolution of 1280x720 that is not bad considering the price of the phone. You don't get a full HD display, but it looks good and renders colors well. We like that the ZTE ZMAX 2 come with Android 5.1, but there are some phones coming from Tracfone that are running the newer, Android 6.0. With Tracfone, you can't upgrade the OS, so whatever version the phone comes with you are stuck using. Android 5.1 is relatively recent, but if you want to get OS updates, you should use an unlocked smartphone with the BYOP program. That concludes our list of the main aspects of this phone we found impressive. Now we want to cover some things that didn't quite impress us. There is a lot to like about the ZMAX 2 when compared with similarly priced smartphones, so it is hard to find any serious negatives about this phone. However, we do want to make a few points clear to help our readers understand exactly what they are getting if they buy this phone. The speaker, battery, camera and screen are all pretty good at this price point and compared to the other smartphone's Tracfone offers like the LG Premier or ZTE Quartz, yet they have some drawbacks. The processor is 1.2 Ghz Quad-core, which is good, but also meant for budget phones. The battery is 3000 mAh, and can last all day with moderate use, but, as is to be expected, the large screen size does tend to drain the battery quickly if used constantly. It is hard to compare the ZMAX to other Tracfone devices because the ZMAX is generally a nice improvement. So why not try comparing it to one of the most popular unlocked smartphones currently available? That will help us see any significant negatives. If you were willing to spend a little more, you could get an unlocked phone like the Moto G4 ($200), which has a 5.5" screen at 1080x1920 full HD resolution, 13 MP camera, and uses a faster, Octa-core processor. The Moto G4 will also get Android 7.0 when that is released. The ZMAX 2 retails for $150, but that includes an airtime bundle worth $100, so you get the phone for just $50. If you buy the Moto G4, it is $200 with no additional airtime, so it actually costs $150 more. Looking at how the ZMAX 2 compares to the Moto G4, we see that spending a bit more money does get you better features, but the ZMAX 2 is also a great deal at the price. One final bit of information to point out there is only one speaker at the bottom of the phone, so the sound can be muffled if set down with the speaker covered, but you can customize some of the settings and adjust the sound. That's it for our likes and dislikes. The ZMAX 2 comes with a lot of good specs at this price. The ZTE ZMAX 2 is ideal for moderate smartphone users who want to use a handful of apps and are also looking for a large display. It is a great value for the money, with better performance and specs than many of Tracfone's other similarly priced smartphones. Many of the recent Samsung and LG phones such as the Samsung Galaxy Luna, LG Treasure, LG Premier and others, have just half the memory and RAM of the ZMAX 2. For heavy smartphone users, who may play graphics-heavy apps or run lots of apps at once, it would probably be worthwhile spending a bit more money to get a more powerful device (like the Moto G4). The Tracfone ZTE ZMAX 2 is available from HSN with 1200 minutes for $150. It is also sometimes on sale for $129. Take a look at the Interactive Tutorial for a closer look at how the phone works. We hope the information provided in this review is helpful, and please leave a comment with any thoughts or questions. We also want to include some additional helpful information about Tracfone smartphones. There are regular airtime cards and smartphone-only airtime cards. You can use both with Tracfone smartphones. Regular airtime cards such as the 60, 120, 200 minute cards, triple on all smartphones. Smartphone-only airtime cards do not triple. Airtime is split into three 'pools' of talk, text and data. When you add airtime, you usually get a certain amount of each. Send a text will only use your text 'pool', just like calling will use your talk time, and surfing the web or other online activities will use your data (if you are not on WiFi). We will also be reviewing the ZTE Max Duo in the near future, so keep an eye for that especially if you're looking for a phone with a 6" screen. Don't forget to check out our list of Great Deals, Discounts and Sales including some of the best unlocked phones to use with the BYOP program. And join over 2000 other fans who follow us on facebook where we post the latest news and updates.